Thai New Year (Songkran Festival or Water Splashing Festival) is a major holiday in not just Thailand but also other countries in Southeast Asia. Here are 10 interesting facts about this important and popular holiday. Thailand's New Year is called "Songkran"
A new year of Thailand is known as Songkran. As most of the Western countries celebrate their New year on 31st December at midnight, and for them, the 1st of January is the first day of their new year. Similarly, in Thailand celebrations of the New year took place differently. New year in Thailand is known Songkran and is celebrated in the mid-April. It can be the hottest time in most of the southeast Asian countries. The new year is the most important holidays in Thailand. 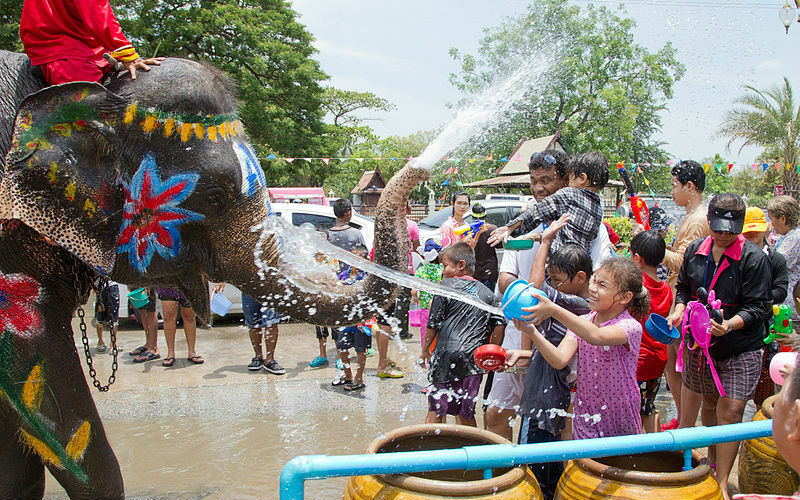 Water is one of the most important element during the celebrations of Songkran. Traditionally, it is being considered that a flow of water on you during the celebrations of Songkran can wash all of your bad luck. You will find a lot of people flowing water on each other during The Songkran celebrations. According to them, this can wash the bad luck and sins of a person from the past year. During the celebrations of Songkran, people apply wet white paste too with the flow of water. This white powder is being applied by the Thais on the necks and faces of each other. They consider it a blessing and think that it can help them to stay safe from all of the bad lucks during next year. Thai's tie white strings to the wrists of each other during the celebrations of Songkran. They consider these strings as a way to wish good luck to others. They recite their Holy prayers while tying the strings, that are for the blessings for the individual. These strings are left on the wrist until these strings fall off. So, do not hesitate to offer your arm when someone asks you to tie a string. Besides the biggest water fight, the true meaning of New year celebrations for Thais is a chance to clean their homes and their souls from sins and bad luck and to prepare themselves for better luck for the next year. Most of Thai return to their homes to spend this splendid event with their family. Children pour water on the elders to thank them and to pay them respect. After coming back to the home, all the members of a family help the housewife to make their home clean. They believe that any rubbish or dust to their home during this event can bring bad luck with, for their house. So, they have to clean their houses spotlessly to welcome the fortune to their house. With the starting of Songkran celebrations, people visit the temples to make prayers and offer food to the Buddhist monks. And pour water on each other to bring blessings and good luck to them. How to be prepared for Songkran? To participate in all the celebrations of Songkran, it is better to equip yourself to stay safe. Select an appropriate outfit for you according to the type of celebrations you are going to attend on Songkran. Get goggles for you to wear, this can help you to save your eyes from any kind of side effects. Do not forget to bring a plastic bag with you to make your valuables safe from water. If you want to capture the precious moments, try to bring a waterproof camera with you or pack your camera in a plastic bag to let it stay dry. The most important thing to do while enjoying the celebrations of Songkran is to stay calm. You can get a lot of crowd around you, that can be irritating for you, but you have to be patient and calm during this situation. And do not worry about the arrival of tankers, because it is normal during the celebrations of Songkran. One of the most well-known events that you can attend during the celebrations of Songkran is Miss Songkran Beauty Contest. This can be held at different places. You can attend that is near to you. in this event you can see the most beautiful 74 women of Thailand. In this contest, all the girls that you are going to see will be in traditional dressing. Winner of this contest will get a pride place in the parade. In Thailand, you can get merits such as releasing fish or birds. According to Thais, these freed animals can bring good luck to them. These all celebrations are not being held on one night, you can enjoy the New year celebrations in Thailand for more than three days (Songkran Festival in Pattaya last for a whole week!) During these three days of celebrations street in Thailand can have a massive water fight. People throw water on each other. There are some rules that you have to follow during Songkran. First of all, do not throw water on Buddhist monks. Second, avoid throwing water on Police officers and officials. Last but also important, do not splash dirty water and/or ice-cold water. People pray for the rain, and they consider The Songkran as an end to the dry season, because for the agriculture in Thailand rainy season is important. If you do not want to be soaked during Songkran, it is better for you to stay at your residence. It is because going out during Songkran means that you are going to be wet for sure. Thai New Year witness the peak of the travel period in Thailand. The heaviest travel periods are a few days before Thai New Year and around 3 days after. Get your tickets as early as possible before the holidays. Check Thai New Year. Want a memorable tour during this biggest event in Thailand? Contact our travel experts and get your personal quote now!